The Steeple and Belfry are adjoined properties located in the desirable Weaponness area of Scarborough on a quiet, leafy street lined with large Victorian properties. Located within a mile of Scarborough beach and the town centre, you will find the location perfect for exploring all that Scarborough has to offer. There is plenty of parking once you have arrived. We provide permits for convenient on-street parking in front of the property. There is also an unrestricted parking area immediately across the road for any visitors during you stay. 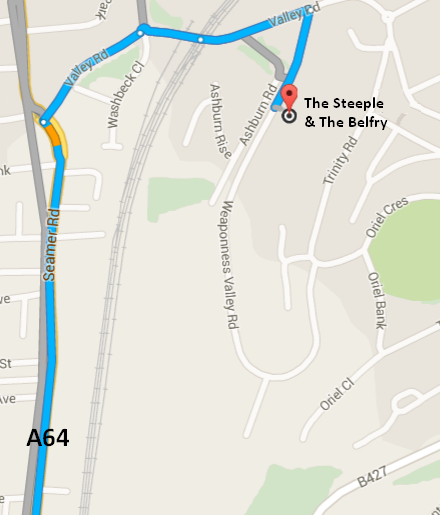 Getting to The Steeple & Belfry is easy. See more details below. From the A64 (York to Scarborough road), head towards the town centre on Seamer Rd, past B&Q and Currys/PC World until you reach a set of traffic lights at a dip in the road. Turn right into Valley Rd, head under the railway bridge and you’ll see Weaponness Valley Rd about 50 yards on your right. Turn right out of the railway station and right again at the traffic lights towards the Valley Bridge on the A165. At the first intersection, turn right into Westwood and drive past Tesco on your left. The road takes a sharp left before heading down towards Valley Rd. Turn right at the junction (the Co-operative is on your right). Weaponness Valley Rd is the first road on your left. If you’re flying in from Manchester or Leeds/Bradford Airports, head for the A64 around and take the Scarborough turn off at the major roundabout at York. Stay on the A64 until it turns into Seamer Rd. Then follow the ‘By car’ directions. Follow the A64, through 3 round-a-bouts. You will pass Morrisons on your right after the second round-a-bout and B&Q and Curry’s on your right after the third round-a-bout. On street parking is available on Weaponess Valley Road (parking permits can be found in your apartment) or there is currently unrestricted parking on Ashburn Road. Please be careful to check for any changes in parking restrictions on this street.